A paper by Michael Czajkowski, Dapeng Bi, lisa Manning, and Cristina Marchetti titled “Hydrodynamics of shape-driven rigidity transitions in motile tissues”, was published in the June 14, 2018 issue of Soft Matter. Full text of the paper is available at https://pubs.rsc.org. A paper by Daniel Sussman, Mateo Paoluzzi, Cristina Marchetti, and Lisa Manning titled “Anomalous glassy dynamics in simple models of dense biological tissue” was published in the April 6, 2018 issue of EPL. Full text of the paper is available at http://iopscience.iop.org. Lisa Manning was featured in a Q&A for Quanta Magazine on June 11, 2018. In it, she discusses how the study of dynamic glassy materials can help us better understand embryonic development and disease. Read the Q&A at www.quantamagazine.org. More than 30 educators from across the United States attended the inaugural “Building Authentic Partnerships” workshop on June 25-26, 2018. This workshop, held at UC-Irvine and sponsored by grants from the Research Corporation for Science Advancement and NSF, was designed to inspire new and creative partnerships between minority-serving institutions and primarily white institutions. Organizers are currently reviewing applications for $20,000 in seed funding to support such partnerships. More information about the workshop is available here. Congratulations to Giuseppe Passucci, who successfully defended his doctoral thesis on April 18, 2018. 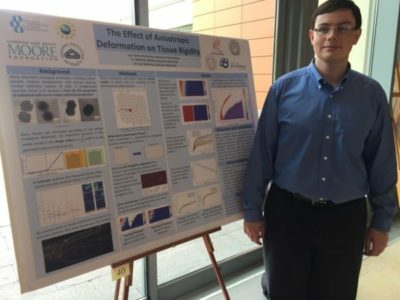 Giuseppe’s thesis is titled “Self-propelled particle modeling, characterization, and imaging of superdiffusive fibroblast cells on 2D shape memory polymer substrates” and is available through the SU library at https://surface.syr.edu/etd/869/. Lisa Manning, in collaboration with an organizing team of other Cottrell Scholars, will chair a 2-day workshop at UC-Irvine on June 25-26 called “Building Authentic Partnerships: Minority Serving Institutions and Primarily White Institutions Working Together to Improve Research and Education.” The objective of the workshop is to develop strategies and policies to help minority serving institutions (MSI) and primarily white institutions (PWI) develop authentic, sustainable partnerships that are mutually beneficial for faculty and students. Visit the workshop webpage for more information, including a full schedule and a list of speakers and facilitators. This workshop is funded by a grant from the Research Corporation for Scientific Advancement. Lisa Manning has received the 2018 Maria Goeppert Mayer Award from the American Physical Society (APS) for her use of computational and analytical tools to develop microscopic understanding of flow in disordered materials, ranging from metallic glasses to biological tissues. 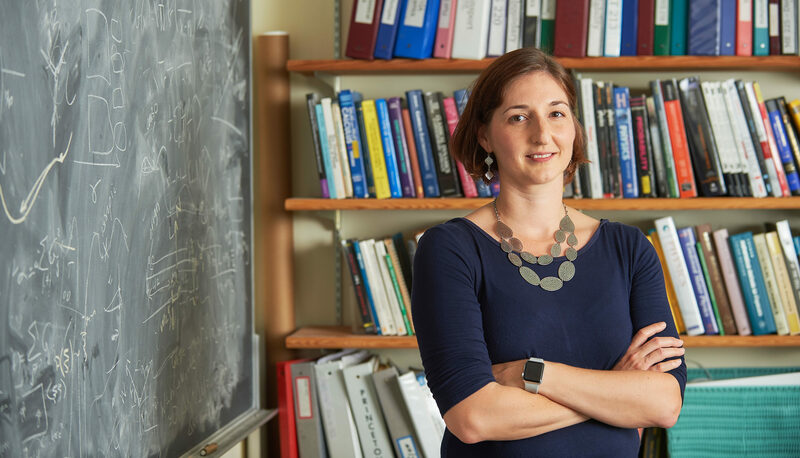 This prestigious national award is given to one woman physicist each year for scientific achievements within the first 10 years of receiving her PhD. The award includes a $2,500 cash prize and additional funds for invited lectures at up to four institutions. Lisa will accept the award at the APS March meeting in Los Angeles. As part of Syracuse University’s “Orange Central” homecoming program, Lisa Manning gave a public lecture on how physics can describe whether cancer cells behave like solids or like fluids, including how the relationship between a cell’s perimeter and its area can predict whether it will remain stationary or migrate. Read more at asnews.syr.edu. Lisa Manning is the PI on a $25,000 Cottrell Scholar Collaborative Award from the Research Corporation for Scientific Advancement to fund ongoing two-way partnerships between minority-serving institutions (MSI) and primarily white institutions (PWI). This project will begin with a two-day workshop hosted at the University of California-Irvine in June 2018. The ultimate goal of these collaborations is to develop best practices for increasing participation in STEM research among underrepresented minority populations. Leo Sutter, an undergraduate physics major from the Rochester Institute of Technology, successfully completed a 10-week Syracuse Biomaterials Institute Research Experience for Undergraduates in the Manning group. Under the direction of postdoctoral associate Matthias Merkel, Leo studied the mechanical behavior of anisotropic confluent tissues. Working at RIT with Dr. Moumita Das, he has also studied the mechanical behavior of cancerous cells.